Harrisons Direct are leading suppliers of wholesale Art and Craft Materials to retailers across the UK! Get crafty with our great selection of wholesale art and craft materials today! Here at Harrisons Direct we have a wide range of wholesale art and craft materials suitable for a range of requirements. 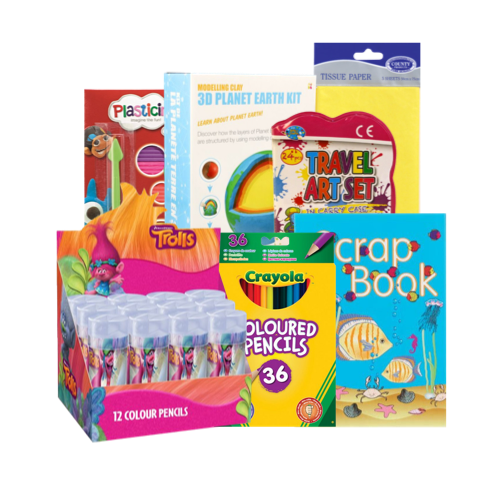 So, whether you're looking for wholesale craft card, wholesale crayola, wholesale craft kits, clay, paint or scrap books you'll find it right here at Harrisons Direct! It is easy to view and order on our website. You can search our entire wholesale arts and crafts category by item name, catalogue number or browse through the categories to find exactly what you need. We're confident that you will be impressed by our range and find everything you need right here on our site! Can't find what you're looking for on our website? Call a member of our customer care team today on 01254 306840 and we'll be happy to help! Get set for the great outdoors with Summit!